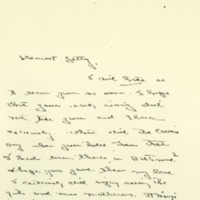 Margaret writes to Jessie about her social life, describing her suitors and nature walks, and asks her to send some cosmetics she had left behind on a previous. I did hate so to leave you so soon. I hope that your early rising did not wtire you and Flora extremely. What did the cousins say when you told them that I had been there, in Baltimore? I hope you gave them my love. I certainly did enjoy seeing the girls and Mrs Mathews. St Mary's is simply enchanting. It stands in a perfectlybeautiful grove. The main building is a nice looking old brick building. The parlour in it is about the size of our's in college and beyond comparison more comfortable and artistic looking. As for Nellie's friends I simply fell in love with them, especially Janie Du Bare. Little Annie looked the picture of health but is considered by her Mother to be in very bad health. I am having a lovely time here. I reached here Monday morning. That evening two of the young professors came to supper. Day before Yesterday my two partners for the dances came to supper. One of them is very entertaining, the other very nice. The latter is Annie's special. Yesterday afternoon I walked in the woods with George. While I was gone one of the young professors came to walk with me and left a beautiful rose for me. He came in again last night He is very very nice. He is the one that ran away from Aunt Margaret because he felt himself falling in love with her and did not choose to have her fool with him. He knew what she was, a flirt. Every body in this town men, women and children are crazy over her. This afternoon I am going to walk with this same professor. The colour of the woods around here is simply wonderful, and Jessie I cannot find words with which to describe my admiration of the wonderful colour of the oaks: I never in my life saw such a colour in a tree. Now dear, pleasesendme my coldcream and zinc ointment that I left in your room. I underline my sentence because I am in a frantic hurry for them. The cold cream is the only kind I dare to use for fear I will get more hair on my face, but I have to use some kind for my face is very dry. It even has little white scales on it in places. The zinc ointment I want for a burn on my neck, from a mustard plaster—As I want both my face and neck to be beautiful before the dances I am crazy for those two things immediately. Please mail them to me. I wrote to Mother yesterday and told her of your new troubles and complications. It is most time for lunch so I must stop. Wilson, Margaret Woodrow, 1886-1944, “Margaret Woodrow Wilson to Jessie Woodrow Wilson Sayre,” 1907 November 15, WWP17417, Jessie Wilson Sayre Correspondence, Woodrow Wilson Presidential Library & Museum, Staunton, Virginia.